Find your next relaxation getaway amongst the stars at this week’s Featured Property, Emerald Star. This home is architecturally designed for spectacular views that you will see from every angle of this magnificent home. The 4 bedroom (4 kings, 2 bunk beds, 1 rollaway, 1 queen sleeper sofa) and 5 ½ bathroom oceanfront cottage features 4 master suites with private bath and deck access. Find not just one, but three living areas all with flat screen TVs and Blu-ray players. There is a wet bar and deck access in the second living area and DVR in main living area. Your family will surly be able to spread out and relax throughout this house. Step into your fully furnished kitchen and get ready to cook your family’s favorite dishes and venture into new cuisines. 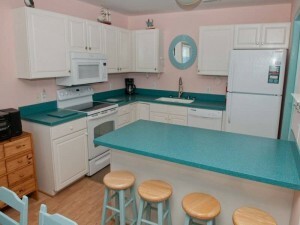 Your family meals can be enjoyed in the dining area that features a 10-person dinner table and 4 barstools. Emerald Star is also equipped with washer/dryer, dishwasher, 2 refrigerators, wireless high speed Internet access, iPod docking stations, ceiling fans throughout, water softener, built-in hair dryers and free unlimited long distance in the US and Canada. Of course all the fun cannot be contained indoors. Come on out to the decks that are furnished with rockers, porch swing, chaise lounges and picnic table. Watching the sunrise out here with your cup of coffee is sure to make each morning extra special. Next to your deck, you will find a hot/cold shower with changing area and your private oceanfront 30’ x 14’ swimming pool and a 6-person hot tub. 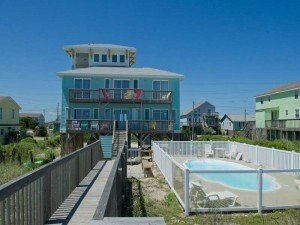 We cannot forget to mention the main reason you chose to vacation in Emerald Isle, the beach. 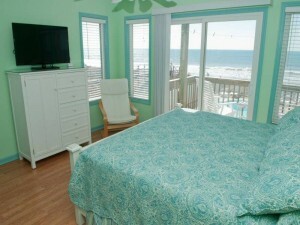 You are just steps away from the gorgeous sands of the Crystal Coast. Days of sunbathing, building sand castles and splashing in the ocean water are just a reservation away. 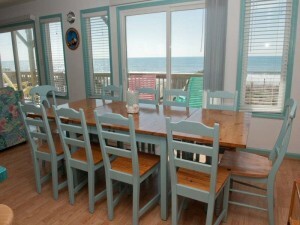 Check rates and availability for this oceanfront condominium from Emerald Isle Realty.  View additional property photos of Emerald Star. “We just returned from our 5th trip to Emerald Star. It is a beautiful home and well appointed by the owners. The location is perfect. 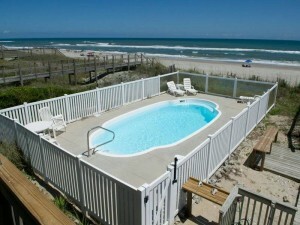 It has a large beach and very nice pool and hot tub. We have been there with just adults and plan to return this fall. Since the large addition we were able to enjoy the house with our adult kids and grandchildren. It had all the space we needed with many nice amenities. We stayed through Hurricane Arthur and did just fine. The next day was beautiful. The owner has written a book entitled “Blackbeard: The QAR Project” It is a must read. The Emerald Star is a true ‘gem.’” – Glenn P.